Rotary Hammer Masonry Drill Bits. We've been selling the Hammer Bits for over 20 years and have found these to be a quality bit. There are less expensive bits, but we've had customer after customer tell us how our bits last longer on difficult materials and drill faster. While we are not the least expensive, we are very competitive when life of the bit and number of holes produced is considered. All Rockhard bits are manufactured in EU. Quality Products, specially recommended for fastening. For Professional Drilling in concrete, brick and stone. TMS treatment (stress relief) for superior strength. Meets all tool manufacturers sepcificaltion. Specially brazed for superior performance. Produced according to ANSI Standards. Try our products. When you get your order, try a bit. If that bit does not measure up to your expectations, call us, we'll send UPS to pick up the entire order and give you full credit for it. There is a lot of confusion about SDS and SDS Plus and SDS-MAX and what kind of drills they fit. SDS or Slotted Drive System (or SDS Plus of SDS+) was developed by Bosch in 1975 for use in it's smaller rotary hammers. SDS (or Slotted Drive System) bits for hammer drills/rotary hammers allow the bit to slide in the chuck and enhance the hammering action of the tool. 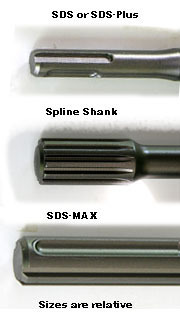 SDS-Max was developed later for larger hammers.